When you need some really good party drink recipes, go to an expert. 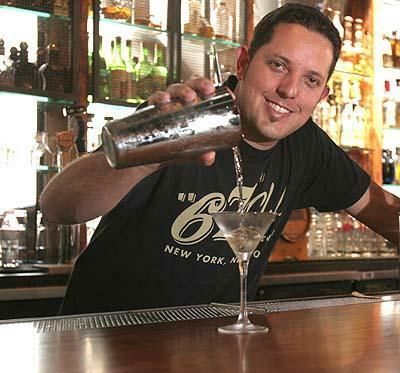 Jacques Bezuidenhout is a "master mixologist" with a talent for amazing cocktails. Check out some of his Million Dollar cocktails for your next party. Macallan 25-year-old single malt whisky, Pedro Ximanez Sherry , Lemon Juice & honey Syrup. Served on the stem. This is known as The Chateau of Malt Whisky. The Macallan is located in the Speyside region of Scotland. Macallan is known for it's rigorous standards and exceptional quality. Macallan has some of the smallest copper stills in Scotland, which produce a very dense rich spirit. Mostly it is recognized for its sherry barrel-aging program. Macallan buys Spanish-grown oak and has it coopered in Jerez. Then they loan the barrels to Sherry Bodegas to age sherry in for a couple of years before shipping them back to Scotland to fill with Whisky. The Macallan 25-year-old single malt is an exceptionally complex whisky. It has a subtle smokiness that is enhanced with dried fruit & cinnamon notes from the Sherry Casks. The finish is long and dry. Pedro Ximenez is a Spanish grape varietal and commonly used to make Sherries. Generally this is a sweeter style sherry. This Pedro Ximenez sherry from the Garvey Bodega has some sherry from 1860 in the Solera blend. This Gran Orden sherry is dark, rich and is described as smelling the Perfect Raisin. As Macallan is known for its Sherry wood influence, I wanted to enhance this by adding Sherry into the mix. I wanted to add a little sweetness to the drink so I decided on the Pedro Ximenez sherry. This particular one has incredible raisin flavors. This adds to the 25-year-old Macallan, which also has dark fruit and nutty characters from the use of sherry barrels. The Honey syrup adds great flavor and a silky mouth feel. The fresh lemon juice balances all the flavors. Chateau De Ravignan 1979 Bas Armagnac infused with Madagascar Vanilla Bean, Orange Peel, Raisins & served with Dom Perignon. This is one of the most prestigious and well known Champagnes. The Benedictine Monk Dom Perignon is credited with inventing or discovering champagne. The best fruit is used for this champagne and it ages for 7 years on the lease before we are able to drink it. It has great citrus and toasty notes and the bubbles are magical. So much so that Dom Perignon upon his discovery was quoted as saying "Come I am drinking the Stars"
The making of Armagnac dates back to 1411 long before Cognac. It essentially uses the same grape varietals but only goes through a single distillation in a Alambic Armagnacais still. Therefore Armagnac is often more robust and rich. Chateau de Ravignan is one of the most well respected Armagnac producers in the region. The 1979 is an incredible Armagnac and it has Apricot, Vanilla and Raisin notes with a long finish. It is traditional in Gascony to make different Champagne cocktails with Armagnac. I wanted to add to the raisin and vanilla notes of the Armagnac so I infused the Armagnac with raisins, orange peel and Madagascar vanilla beans. This adds a little sweetness to the spirit and makes it exceptionally rich in flavor. By adding a small amount to a flute full of Dom Perignon the whole cocktail comes together. The toasty citrus in the champagne work well with the Armagnac. Each bubble that comes to the top brings out more of the Armagnac's flavor. Remy Martin Louis XIII, Domaine Charbay Walnut Liqueur, Porto Rocha 20-year-old Tawny served in a snifter washed & flamed with Chartreuse VEP. The art of Cognac lies in the Master Blender of the house. It is his job to blend different barrels of Cognac at different ages together to create a masterpiece. In the case of Louis the 13th the youngest Cognac in the blend is 40yrs old. There is a small amount of cognac in the blend that is up to a 100yrs old. This is an exceptional Cognac with many complex flavors and a finish that goes on and on. Domaine Charbay is a small distillery located in St Helena. The family has decades of experience in the art of distillation. They infuse Black & English walnuts in their own brandy for two years. They finish of the liqueur by blending it with herbs & spices. This is a delicious liqueur with dark, sweet walnut flavor. This 20-year=old Tawny from the Douro region in Portugal has a rich Nutty flavor that works well with the other spirits. It is an aged Tawny that picks up many dark fruit and nutty notes through the barrel aging. The Carthusian Monks have been making this elixir since the 1600's. The VEP is 108 proof and contains 130 different Plants & Herbs in the spirit. Only 3 Monks know the recipe. This elixir is wonderfully herbal and rich. This cocktail I do not mix with ice as all the flavors are very complex but delicate due to all the years spent in wood. I wanted to add to some of the nutty flavors of the Cognac by using the Walnut Liqueur and the port. The port gives the cocktail a little acidity and tannins. The Snifter is heated by setting the Chartreuse a blaze. This burns off much of the alcohol in the Chartreuse and adds a great dry herbal finish to the cocktail. Partida Elegante, Chateau d'Yquem 1994 Vintage Sauternes, Rooibos Tea and Orange Bitters served on the stem. This 100% Agave Tequila is one of the benchmarks in super premium tequilas. This Anejo Tequila spends up to 38 months in used Bourbon Barrels. Because of the hotter climate in Mexico is the equivalent of a 20yr old single malt or a XO Cognac. This is phenomenal tequila that has complex wood flavors and a deliciously rich agave flavor. This Premier Cru Superieur Sauternes from the Sauternes region in France is one of the most renowned dessert wines. They are known for their noble rot wines that have incredible aging potential. There have been tastings with d'Yquem from the late 1800's. These wines are incredibly rich with apricot and orange blossom flavors. The Rooi Bos tea leaf is grown on the mountains in Cape Town. They are known for their antioxidant qualities and contain no caffeine. This particular tea has great Orange and Orange blossom flavors with some tannins. The d'Yquem has apricot and Orange flavors that work really well with the tea and compliment the tequila. As the flavors in the tequila are complex but delicate I could not use Orange juice or citrus juice as it over powered the tequila and the sauternes. The tea has delicate flavors that bring it all together. The Orange bitters dry the flavors in the cocktail and provides a perfect finish. These party drink recipes are just what you need to make your event a memorable occasion. Just don't forget to pair your cocktails with plenty of appetizers so your guests can have a good time without getting too tipsy!